I have wandered by Taj-Kumal, by road and beach, countless numbers of times. 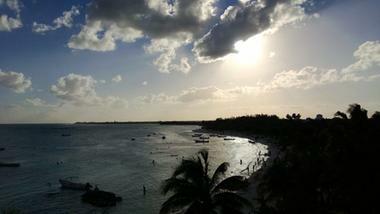 It is the only rental villa located on Akumal Bay. Nestled between Centro Ecológico Akumal and Las Casitas, it is the perfect location, in my opinion, if you want privacy but stille want to be right in the middle of everything. Recently I toured Taj-Kumal. They are doing even more renovations so I look forward to visiting it again soon. I was certainly impressed. Entering from the road there is a lovely private two-story casita with a pretty bedroom and private bath. The grounds are impeccably kept and there are shade trees, lovely flowers and conversation benches. As you approach the main villa, you can't help but notice the gorgeous hand-carved door and the subtle sculpture next to it. The art and attention to detail highlight this beautiful beach villa. As I opened the door, my eyes lit up with so many great views and interesting, yet comfortable, touches. One of the first things I noticed was the miniature sculpture which is a replica of the one at the entrance to Akumal. The use of bottles in the wall which allows color and light to stream in is another lovely touch. And that door that was so elegantly carved on the outside had an entirely different carving on the inside. The layout has comfortable seating areas and is a great use of space. The living room, dining room, bar and kitchen flow with a unique style and definite feng shui. The pool area is private and perfect for relaxing or throwing an evening gathering, with an area to grill, lounge chairs and tropical foliage. 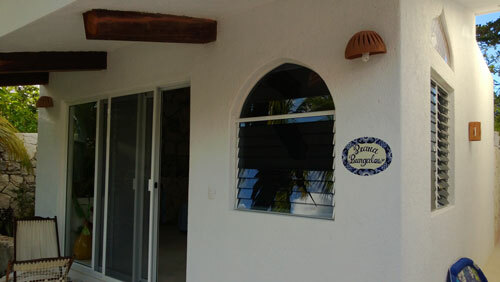 The master has one of the best views in Akumal with large windows and a wonderful private bath. The rooftop is another amazing area for privacy and entertaining, and the view of all of Akumal is spectacular. I can't imagine a nicer place to watch a sun or moonrise! The bedrooms are all large and well decorated. The private casita near the pool even boasts an outdoor shower. We were able only to visit this wonderful villa so we can't do a full review, but in the future we hope to have the opportunity to stay in this prime property! We feel it would be perfect for small groups and families who want to have privacy while being only steps away from all the action in Akumal.